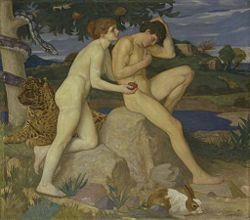 The temptation of Adam: the rabbis concluded that the tendency to evil, or yetzer harah, pre-existed the first sin. The term yetzer refers to the inclination toward either good or evil. The yetzer harah is thus balanced by the yetzer ha-tov or tendency toward good. In Judaism, the yetzer harah is not the product of the Human Fall, as in Christian teaching, but is part of the original creation of God. While it does lead to sin, it is also essential, for without it, there would be no ambition, economic progress, or even procreation. However, some of the ancient rabbis held that God came to regret creating the yetzer harah and that it will eventually be done away with in the world to come. The rabbis universally teach that the yetzer harah must be controlled and trained to follow the Law of God. Humans need to cultivate its opposite—the yetzer ha-tov—by studying the scriptures, following the God's commandments, engaging in prayer, helping ones fellow man, and other good works. Although it is usually spoken of as an impersonal force, the yetzer harah is sometimes personified as Satan, sin, or the angel of death. Christian tradition inherited a sense of the yetzer harah, but under the influence of Saint Paul and Augustine of Hippo, Christianity came to see the evil tendency as the result of original sin rather than part of man's nature as endowed by God. The concept of the yetzer harah is derived from from Gen. 8:21: "The imagination of the heart of man is evil from his youth." The expression yetzer is used both in Deuteronmy 31:21 ("I know what they are disposed to do") and Isaiah 26:3 ("Thou wilt keep him in perfect peace whose mind is stayed on thee") to refer to the disposition or mind. However, the the term "heart" or "evil heart" usually takes its place in biblical theology as the seat of temptation and sin in humans. Thus, the "evil heart" referred to in Jeremiah 16:12 is analogous to the yetzer harah. The first definitive passage in which the term occurs is in the Hebrew text of Eccliasticus (Sirach) 15:14, written in the second century B.C.E. : "God created man from the beginning… and gave him into the hand of his yetzer." In 6:22 of this text, man is compared to the fruit of a tree, while his thoughts are according to his yetzer. 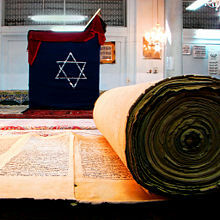 In later Jewish writings, talmudic and midrashic traditions developed the concept of the yetzer harah to a great extent. As with most theological concepts, the rabbis expressed varying views on the subject. However, they agree that the yetzer harah was part of man from the beginning rather than the result of original sin, since the first sin could not have occurred without it. Moreover, while it is to be resisted, the yetzer harah is not without its usefulness. 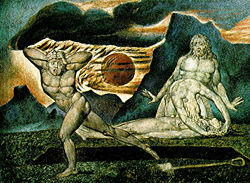 William Blake's Cain, with Adam and Eve mourning over the body of Abel. Rabbinical tradition holds that Cain defended himself before God by arguing that the yetzer harah was God's creation. In rabbinical tradition, it was in reference to this evil impulse that God warned Cain that "sin lies couching at the door but you must master it." (Ber. 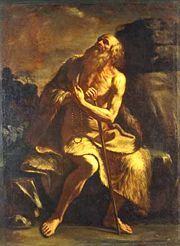 61a) Moreover, Cain defended himself before God for having slain Abel by arguing that God had implanted in him the yetzer harah (Tan., Bereshit, 25). In a certain way, however, the yetzer harah, like all things which God made, is good. Without it a people would never marry, beget, build a house, or engage in trade (Gen. R. ix. 9). When a human is enjoined to love God "with all thy heart," this means that both the good impulse and the evil impulse must be directed in accordance with God's Law (Sifre, Deut. 32). The yetzer harah is thus a natural inclination. Indeed, the yetzer ha-tov only comes with reflection, usually at the age of bar mitzvah or confirmation. This good inclination is even said to be 13 years younger than the yetzer harah, which is inborn (Eccl. R. ix. 14). The yetzer ha-tov delivers the body from the yetzer harah by means of temperance and good works (Ned. 32b). According to the rabbis, the yetzer harah has seven different epithets in the Bible: Evil (Gen. 8:21), uncircumcised (Deut. 10:16), unclean (Psalm 51:12), the enemy (Prov. 25: 21), stumbling-block (Isa. 57:14), stone (Ezek. 36:26), and hidden (Joel 2:20). The yetzer harah is no less strong in the righteous person than in the sinner. Indeed, it is said that "the greater the man the greater his yetzer harah." Despite the rabbinical opinion that the yetzer harah is in a certain sense both necessary and good, it is held by some to be among the four things which God regretted to have created (Suk. 52a). The Torah is the great antidote against the yetzer harah (Suk. 52b; Ḳid. 30b; Ab. R. N. 16). If not tempered by obedience to the Law and other good works, the yetzer harah grows with a man. At first it is a mere traveler. Then it becomes a guest, and at last it is the man himself (Suk. 52b). "Yetzer harah" does not refer exclusively to the body. However, it undoubtedly leads to sensual sins with great power. Thus, both Rabbi Akiba and Rabbi Meir, great sages of the second century C.E., were saved from its influence only by heavenly intercession (Ḳid. 81a). It was to avoid the temptations of the yetzer harah that women were ordered to take separate seats in the galleries of synagogues (Suk. 51b). Revenge and avarice are also mentioned as the outcome of the yetzer harah (Sifre, Deut. 33), and anger is another of its manifestations. It is with reference to anger that the person is called "mighty" who overcomes his yetzer harah (Ab. iv. 2). Vanity is still another form in which the yetzer harah displays itself. When the yetzer harah sees a conceited man it says: "He is mine" (Gen. R. xxii. 13). The yetzer harah belongs only to this world, and does not exist in angels or other higher beings (Lev. R. xxvi). It is for this reason that some believe there is no eating or drinking, procreation or barter, envy or hatred, in the world to come (Ber. 17a; comp. Mark 7:25). 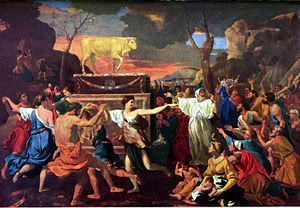 The Golden Calf: Although the Israelites ultimately overcame the temptation to engage in idolatry, the yetzer harah could not be eliminated entirely. The yetzer harah comes to humans at birth, and not before (Sanh. 91b). All the sportive mischief of young children is attributed to the yetzer harah (Eccl. R. iv. 13). The yetzer harah was created by God, but man is responsible for yielding to its influence, since he is able to put it to a good use. The "left hand," which is weak, should reject it, while the "right hand," which is strong, may draw it near (Soṭah 47a; Sanh. 107b). Psalm 81:9—"You shall have no foreign god among you; you shall not bow down to an alien god"—is interpreted as referring to the yetzer harah, to whose influence one must not yield (Shab. 105b). The Israelites eventually succeeded in getting rid of the yetzer of idolatry and the grosser forms of unchastity, but it was still necessary to preserve the yetzer harah lest the world should come to an end. Under the Second Temple, the yetzer harah thus continued to exist because it was needed in the world. The yetzer harah was the source of virtually all of Israel's sins and sufferings: "Woe, woe, is the yetzer harah. He destroyed the sanctuary, killed the righteous, drove the Israelites out of their land, and still dances among us. Why was he given unto us? Only that we may receive reward for conquering him" (Yoma 69b). There is a tendency in rabbinical tradition to give personality and separate activity to the yetzer harah, as in the cases of the angel of death and Satan, with each of whom it is sometimes identified (B. B. 16a). According to Rabbi Jonathan, the yetzer, like Satan, misleads man in this world and testifies against him in the world to come (Suk. 52b). On some occasions it is made exactly parallel to sin. Thus, the parable told by the prophet Nathan to King David (2 Sam. 12:4ff) is interpreted as applying to both sin and to the yetzer. Man's evil tendency overpowers him every day (Ḳid. 30b). At first it tricks him, but then it dwells in him (Hos. 4:12, 5:4). So too, Psalm 34:2, "sin speaks to the wicked," is applied to the yetzer (Ab. R. N. 32). The personification of the yetzer harah is also seen in the statement of Genesis 4:7: "Sin is crouching at your door; it desires to have you, but you must master it" (Ḳid. 30b). All men are divided into three classes: the righteous, under the rule of the yetzer ha-tov; the wicked, under the rule of the yetzer harah; and a midway class, ruled now by one, now by the other (Ab. R. N. 32). According to other authorities, there are only two classes: the righteous who follow the good yetzer, and the wicked who submit to the evil yetzer (Eccl. R. iv. 15, 16). The first part of Ecclesiastes 11:9—"Follow the ways of your heart and whatever your eyes see"—is said to relate to the joy of youth derived from the yetzer harah. The second part—"but know that for all these things God will bring you to judgment"—indicates that God will bring all transgressors under judgment (Shab. 63a). There is a contrast of strength between the two tendencies. Thus, "Blessed is he that considereth the poor" (Ps. 41:2) is applied to him who makes the relatively poor and weak yetzer ha-tov rule over the yetzer harah (Lev. R. xxxiv.). Though the evil tendency is seemingly so powerful, resistance easily overcomes it. If a man finds that the yetzer harah is too strong for him, he should go to a place where he is not known, and not profane the name of heaven openly (Ḥag. 16a). Study and practice of the Law, attending synagogue, and good works are seen as crucial means of controlling the yetzer harah. Just as iron can be made into all sorts of vessels if cast into the fire, so one can make the yetzer harah useful by training it to follow the words of the Law. In Proverbs 25:21 we learn that "if thine enemy be hungry give him bread to eat." The rabbis interpreted this as meaning "when the yetzer harah prompts a person, he should give it the 'bread' of the Law" (Pesiḳ. 80b). Both of the yetzers are to be utilized, just as when a man has two oxen, one meant for plowing and the other not, he puts the yoke upon both on both of them. The Law is like a plaster to the wound made by the yetzer harah. If the plaster is taken away, an evil ulcer will come forth (Ḳid. 30b). The Law will wear away the yetzer harah as water wears away stone (Suk. 52b). Both the Law (Ex. 24:12) and the yetzer harah itself (Ex. 34:26) are called a "stone." Thus, the one stone must guard the other stone (Cant. R. vi. 11). The stone of Genesis 29:3 is also compared to the yetzer: As the stone is rolled away from the mouth of the well, so the yetzer harah departs when men go into the synagogue to drink of the Law (Gen. R. lxx. 8). Thus, the Jewish night prayer said in connection with the Shema includes the clause "let not the yetzer harah rule in me" (Ber. 60b). In the end, some rabbis hold that God will finally destroy the yetzer harah, as is promised in Ezekiel 36:26: "I will give you a new heart and put a new spirit in you; I will remove from you your heart of stone and give you a heart of flesh." It is because the yetzer harah anticipates this final punishment that it attempts to bring man to destruction (Ab. R. N. 16). Meanwhile, like a stone, it gradually crumbles away until it no longer forms a stumbling-block, if one follows the Law conscientiously. The doctrine of the yetzer harah has both similarities and differences from the Christian view of the way evil works in humankind. Certainly, Jesus was aware of the evil tendency within the human heart. Thus, in the Lord's Prayer he taught his disciples to pray: "Lead us not into temptation but deliver us from evil." Later, outside the Garden of Gethsemane, he warned them of the evil tendency to give in to sleep while keeping vigil: "Watch and pray so that you will not fall into temptation" (Matthew 26:41). In the Sermon on the Mount, Jesus adopted the rabbinical attitude that his disciples must carefully follow the Law in order to overcome the tendency to evil: "Unless your righteousness surpasses that of the Pharisees and the teachers of the law, you will certainly not enter the kingdom of heaven" (Mt. 5:20). He goes on to command them not only to keep the Ten Commandments and other Jewish rules, but to go beyond them. Saint Paul: "I see another law at work in the members of my body, waging war against the law of my mind and making me a prisoner of the law of sin." Saint Paul seems to be speaking of the yetzer harah in Romans 7:7-24 when he says such things as "I see another law at work in the members of my body, waging war against the law of my mind and making me a prisoner of the law of sin at work within my members." However, the stark contrast between the flesh and the spirit emphasized by Paul and other Christian writers exists nowhere in mainstream Jewish theology. His attitude is thought to have been influenced by Greek philosophical ideas derived from the dualism of Plato, to which he, as a Hellenized Jew, was exposed. For Paul, humans were hopelessly alienated from God and unable to keep the Law. In other words, they were incapable of resisting the yetzer harah, even when they tried to follow the Law. For Paul, salvation could be achieved only by faith in Jesus' atoning death and resurrection. The Pauline attitude came to predominate as Christianity diverged from its Jewish roots, overtly rejecting the Jewish Law as the means to control man's evil tendencies, while continuing, somewhat ironically, to emphasize the Ten Commandments and other Jewish moral teachings. In the fifth century, the Pelagian controversy brought matters into clearer focus as the monk Pelagius taught that Christians could achieve moral perfection by following the teachings of Jesus and the Ten Commandments. Augustine of Hippo led the intellectual assault in condemning this view, developing the doctrine of original sin to show that humans are irresistibly trapped in concupiscence and that only God's intervening grace, not their own efforts, can save them. Appeal largely to Paul's writings, he further argued that concupiscence was not part of God's original creation, but resulted from the Human Fall. Augustine's view ultimately prevailed. In the meanwhile, the emerging rabbinical tradition of the Talmud was taking Judaism down a different path, interpreting the yetzer harah as an inborn tendency created not by Satan but by God. Cohen Stuart, G. H. The Struggle in Man Between Good and Evil: An Inquiry into the Origin of the Rabbinic Concept of Yeṣer Haraʼ. Kampen: J.H. Kok, 1984. ISBN 9789024225682. Fohrman, David. The Beast That Crouches at the Door: Adam & Eve, Cain & Abel, and Beyond: A Biblical Exploration. Jerusalem: Devora Publishing, 2007. ISBN 9781932687798. Goldberger, Moshe. The Seven Names of the Yetzer Hora: Learning to Deal with Our Greatest Enemy. Staten Island, NY: M. Goldberger, 1993. OCLC 82656543. Leaman, Oliver. Evil and Suffering in Jewish Philosophy. Cambridge studies in religious traditions, 6. Cambridge, U.K.: Cambridge University Press, 1995. ISBN 9780511003875. Rotenberg, Mordechai. The Yetzer: A Kabbalistic Psychology of Eroticism and Human Sexuality. Northvale, NJ: Jason Aronson, 1997. ISBN 9781568218984. Ṿizner, Naftali Tsevi. In His Own Image: A Study of the Human Soul and the Personal Struggle between Good and Evil. ArtScroll Judaica classics. Brooklyn, N.Y.: Mesorah Publications, 1992. ISBN 9780899061696. This page was last modified on 30 July 2013, at 17:09.